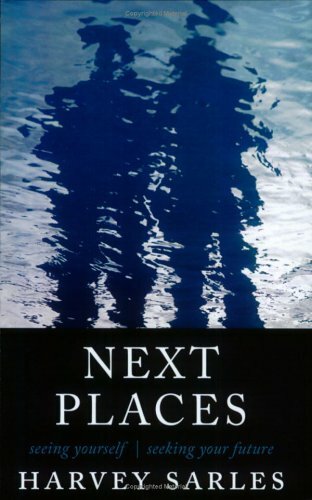 Amazon.com description: Product Description: Next Places is a book for anyone reaching a point of change in life--the young adult moving from school to the world, the professional who is no longer satisfied with his or her work, the person making the transition to another town or a new relationship, the baby boomer contemplating how life will be once out of the workplace, or an older person continuing to open up new paths toward wisdom. Rather than laying out a universal quick fix for dealing with change, Harvey Sarlesâs meditations entice readers to find their own senses of self-clarity. The idea is to handle change by growing oneself in oneâs own terms, whatever these might be at any given time in life. Each personâs path will reveal itself in ongoing meditations. But Next Places is not just for the individual who is experiencing life change. It is a rich compass for any reader who is interested in self-exploration and contemplation. About: Next Places is a book for anyone reaching a point of change in life--the young adult moving from school to the world, the professional who is no longer satisfied with his or her work, the person making the transition to another town or a new relationship, the baby boomer contemplating how life will be once out of the workplace, or an older person continuing to open up new paths toward wisdom.